The All Terrain Personal Transport (AT-PT) is a single-seater, anti-infantry walker. Originally designed in the Old Republic era, its main purpose was to put a single soldier into a combat situation and allow him to defeat an entire infantry squad. AT-PTs were usually accompanied by light mechanized infantry troops for cover against enemy fire. 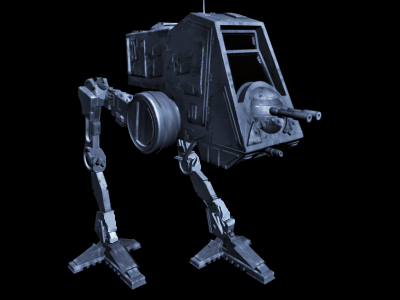 Republic engineers later used the main concepts of the AT-PT to design the AT-ST and AT-AT. The AT-PT consists of a central command pod and two side-mounted legs. The legs could be extended for full observation capacity, or contracted to the 'half-crouch' position for maximum speed. A primitive sensor package was installed into the cockpit to allow for easy navigation across the terrain and simple enemy targeting. The AT-PT is armed with a nose-mounted twin blaster cannon and a chin-mounted concussion grenade launcher. These weapons are extremely efficient against infantry, but proved to be ineffective against other ground vehicles. The vehicle has light armor, but it makes up for it in its higher-than-average speed and its superior balance on uneven terrain.